Welcome to Blogtalk Radio False Reformation this is your host Paul M. Dohse Sr. Tonight, part 4 of “The Protestant Twisting of 1John: A Clarification.” If you would like to add to our lesson or ask a question, call (347) 855-8317. Remember to turn your PC volume down to prevent feedback. Per the usual, we will check in with Susan towards the end of the show and listen to her perspective. If you would like to comment on our subject tonight, you can also email me at paul@ttanc.com. That’s Tom, Tony, Alice, Nancy, cat, paul@ttanc.com. I have my email monitor right here and can add your thoughts to the lesson without need for you to call in. Initially, I wanted to just address 1John 1:9 in a thorough way to debunk this whole Protestant idea that we keep ourselves saved by returning to the same gospel that saved us. And, the way we reutilize the same gospel that saved us is a continued repentance for “present sin.” It’s this whole idea that Jesus died for our past sins, but we must ask forgiveness for known present sin in order to keep ourselves saved. When we do that, it’s a reapplication of Jesus’ death for present sin. Hence, 1John 1:9. And it turns the true biblical gospel completely upside down. First, it makes the law the standard for justification. There is no law in justification, we are justified APART from the law. Why would Christ obey the law for us when justification is apart from the law? Then what is the standard for righteousness? NOT the law, but rather God’s righteousness. What’s that? For one, and primarily, it’s the new birth. For us, the standard of righteousness is being a child of God. Being the offspring of God is what makes us righteous. Kinship, not law. Secondly, we are not justified by the law, no matter who keeps it—who keeps it is not the point, the law itself is the point, because there is no law that can give life. Only the new birth gives life (Galatians 3:21). Thirdly, double imputation is obviously a covering for sin with the righteousness of Christ and not an ENDING of sin. Our sins are not “taken away” they are only covered. “Christianity” is about living a life of faith only to maintain a covering for sin. Therefore, we are not the ones really obeying, and therefore, we are not the ones performing love either. And boy does this notion land us right where we are at in 1John. I have invested so much in the untwisting of 1John 1:9 in this series, that I thought, “I might as well finish the book out and make it our 1John commentary.” And so it is. This is our theses: the new birth creates us anew into people who love the truth, and therefore practice oblove. That’s a new word that I made up. What is the definition of oblove? It’s the combination of the words “love” and “obedience.” Biblically, you cannot separate these two words, they are synonymous. The law is the Bible, and it is a book of condemnation to the unsaved and a beloved love manual for those born again. This is also why our sins are not covered, they are taken away (1John 3:5). Christ came to take away sin, not cover it. You know, many go to church and sing the hymns, and many listen to Christian radio and raise their hands in praise while stopped at red lights, but a lot of that good Protestant music is just really bad theology that imperils the soul and stops far short of inciting the curiosity of the unsaved. One example is a beautiful song by Steve Camp titled, “He Covers Me.” But again, the premise of the song is that our sins are covered and not ended. You know, there is a quiet revolution going on in Christianity. Christian husbands are beginning to stand up and assume their rightful role as spiritual leaders. This necessarily means leaving the institutional church which deliberately seeks to emasculate the men among us. One thing that I hear back is that fathers are beginning to stand silent and not sing traditional songs that are deviations from the truth. Good for them. I even hear back that their children ask, “Daddy, why aren’t you singing?” And they tell them why. Undoubtedly, children and wives will get way more out of these types of examples rather than 365 different versions of the same gospel that saved us. “Why is it that all we ever hear about in the church is the gospel?” Because we have to keep returning to the same gospel that saved us to keep ourselves saved, and by the way, the only place that this continued atonement is valid is in the institutional church. Sure, Protestants will deny salvation by church membership; they will rather become indignant and state that salvation is only found in the gospel. However, the fact remains that they also believe that authority to preach the gospel is vested in the institutional church. If our sins are only covered, the focus of the Christian life is to keep ourselves covered, not obedience because now obedience is defined by law-keeping. We have been trained mentally to think of obedience as something demanded by the law. This makes the law a co-life-giver with God. At least in one regard, the idea of one God connects with this idea. There is only one life-giver (Galatians 3:10-21). I strongly suspect that when the Bible talks about God being one, it in no way includes the context of the Trinity. It’s interesting to note that in context of Galatians 3:10-21, the point is that the law is not a coequal with God—there is only one God. 1John 3:1 – See what kind of love the Father has given to us, that we should be called children of God; and so we are. The reason why the world does not know us is that it did not know him. 2 Beloved, we are God’s children now, and what we will be has not yet appeared; but we know that when he appears we shall be like him, because we shall see him as he is. 3 And everyone who thus hopes in him purifies himself as he is pure. Let’s ask an interpretive question here. What did Jesus mean when He told John the Baptist that His baptism by John would fulfill all righteousness? I think it fulfilled all righteousness by representing the literal new birth, or Spirit baptism. Though we still reside in mortal bodies, the decision to be saved is a decision to follow Christ in baptism, or a decision to be born again. That’s the gospel. 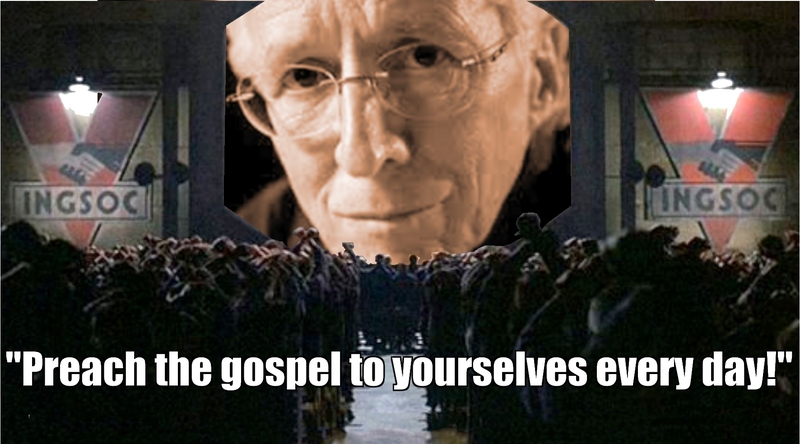 That’s what the gospel is. The more you study the apostle John, the more you will see the apostle Paul. Romans 6 is key here. The perfection of the law is not the standard for righteousness, passing from life to death is the standard. Though we still sin, we are dead to sin. Being deemed righteous in our present state is defined by a reversal of slavery leading to a new direction in life. Romans 6 explains, as we shall see, 1John 3. The literal new birth, in essence reverses slavery (Romans 6:20). This also debunks the whole Reformed total depravity song and dance. Before the baptism of the Spirit that comes by believing on Christ, the unregenerate are free to do good, but enslaved to the law of sin and death (Romans 8:2). Being under the curse of the law is both a forensic statement and a state of being. It is true, while under law, a perfect keeping of the law is demanded. But this is key: when it gets right down to it, unbelievers are indifferent to the Bible or the law of God. And remember, the law and the Bible are the same thing. Man is capable of doing good, and in fact does do good, but because he/she has no love for God’s truth, and in fact are indifferent to it, life decisions lead to many-faceted forms of death, and ultimately, eternal death. Unbelievers that live according to conscience will suffer a lesser punishment in this life and the life to come. Believers can in fact make life and death decisions, but are inclined towards obeying the law because of the new birth. Clearly, the Bible states that there is a reversal of slavery. The believer is enslaved to righteousness, but unfortunately free to sin. But according to Paul, a believer can stupidly enslave themselves to certain sins by obeying the desire that the sin produces. The believer is no longer enslaved to sin, but can be ignorant of this fact. And keep in mind, Protestantism is predicated on the idea that we are still enslaved to sin as believers which goes part and parcel with still being under the law and law continuing to be the standard for justification. Listen, here is why the home fellowship movement is going to eventually take off: the alternative is Protestantism which defines the believer according to how the Bible defines an unbeliever. Eventually, people are going to figure out that they have been proudly proclaiming themselves as unregenerate in the name of Christ. Lastly, this is defined by the fact that believers have the freedom to present their bodies as living sacrifices, or in other words, present their members for holy purposes that please God. The body is not inherently evil because it is part of the material world. Whether saved or unsaved, the body can be used for good purposes. However, in the case of an unbeliever, good behavior doesn’t lead to life more abundantly, it just leads to lesser punishment and a more bearable eternal state. For the unbeliever, good behavior merely leads to less death. For the believer, obedient love leads to more life. John wrote what he wrote in 1John 3 because of what Paul wrote in Romans 6—it’s saying the same thing. Obeying the law isn’t the issue, a “commitment” to obey the law isn’t the issue, the reality of the new birth is the issue. 1Corinthians 15:1- Now I would remind you, brothers, of the gospel I preached to you, which you received, in which you stand, 2 and by which you are being saved, if you hold fast to the word I preached to you—unless you believed in vain. 3For I delivered to you as of first importance what I also received: that Christ died for our sins in accordance with the Scriptures, 4 that he was buried, that he was raised on the third day in accordance with the Scriptures, 5 and that he appeared to Cephas, then to the twelve. 6 Then he appeared to more than five hundred brothers at one time, most of whom are still alive, though some have fallen asleep. This is, as Paul called it, the gospel of “first importance” or literally “the gospel of first order of importance.” There is way more behind this than a mental ascent to the facts of the gospel. You have to believe that this first happened to Christ in order to believe that it really happened to you spiritually. Repentance is a change of mind in regard to many things concerning your life and the life of Christ. John continues in chapter 3 to explain one of the characteristics of being born again, love. But let me insert this, and this is VERY important: the characteristics of the new birth are framed in what the Bible refers to as “abiding.” If God’s seed “abides in” us (1John 3:9), other things also abide in us: the fact that we abide in Him also; the truth abides in us; we know the truth; we love the truth; we love fellow Christians; we do not practice sin, but rather practice righteousness as a life direction and pattern; we love God’s law; we submit to need; we obey; we seek to please God; we have a hunger for learning more of God’s word, and many more can be listed. See, the order in which John discusses these things is in no wise disconnected. We need to start thinking about “obedience” in reference to love and the new birth. Really, the Christian life is about love. But listen, any love that flows from you starts with a love for truth. Also, please take note of a more biblical definition of love: love is a submission to need—that’s love. When the Scriptures tell women to submit to their husbands, that’s just another way of telling wives to love their husbands. When the Bible tells men to love their wives, it’s simply telling men to submit to their needs. Look at 1John 3:17 again. How does benevolence get parachuted into that body of text out of nowhere? John goes from discussing murder to meeting financial need; it seems like he is all over the map, but not really. Lastly, working out the new birth with love leads to assurance. Assurance of salvation comes through working out our new birth in fear and trembling. Assurance of salvation is grounded in the ending of the law because the old us died with Christ resulting in no condemnation, while our new relationship to the law leads us in love and life. Now listen, even a casual student of the Bible can begin to hang Bible verses all over this framework. Next week, we will build on this as we go into chapter 4—let’s go to the phones. Tagged with: "faith alone", "He Covers Me", "perfect obedience of Christ", "perfect obedience", "present sin", "The False Gospel of the New Birth", "the law can only provoke sin", "the law demands perfection", 1John 1:9, Assurance, Authentic Reformed Theology, “The same gospel that saved us also sanctifies us.”, covering sin versus ending sin, Did you sin today?, Double Imputation, faith alone in sanctification, false double imputation construct, Galatians 3:10-21, lack of assurance, No condemnation, Protestantism's Denial of New Birth, Reformed Orthodoxy, Reformed soteriology, Romans 6, standard for justification, Steve Camp, The Australian Forum, The church, the flesh, The gospel, the institutional church, the law of sin and death, total depravity of the saints, what is the gospel, what is the standard for righteousness? Simply stated, Calvinism is a false gospel because it denies that salvation is a onetime event in the life of the believer. In other words, when a person believes in Christ, all of their sins are not forgiven once and for all time. The sins we commit in our Christian life go against our just standing, so we must continually revisit the same gospel that saved us in order to maintain our just standing. This is a problem because we have to do something to keep our just standing. The Reformers taught that salvation as a onetime finished work is a false gospel. In our present day which is experiencing a resurgence of the original Reformation gospel, we assume that the mantra, “We must preach the gospel to ourselves everyday” is just a popular opinion about the best way to grow spiritually in our Christian life. Not so. The revisiting every day of the same gospel that saved us is necessary to maintain our just standing before God. “The same gospel that saved us also sanctifies us” is another popular mantra that is deceptive; a re-visitation of gospel is a must for keeping ourselves saved according to the Reformation gospel. This is why the Reformers redefined the biblical new birth. Instead of the new birth being a onetime event in the life of the believer, making us a new creature, they made the new birth a continual rebirth experience only needed to maintain our salvation. Another way this could be stated follows: a perpetual re-salvation experience. Contemporary Reformed theologians call this “mortification and vivification” in their systematic theology. Steve Camp is a Reformed leader and contemporary Christian music icon. In fact, while still blinded by the ways of Protestantism, I was a huge fan of Camp and have probably purchased every CD he ever recorded. He recently posted a comment on his Facebook page that is an almost perfect thumbnail of Protestant heresy and churchianity in general. 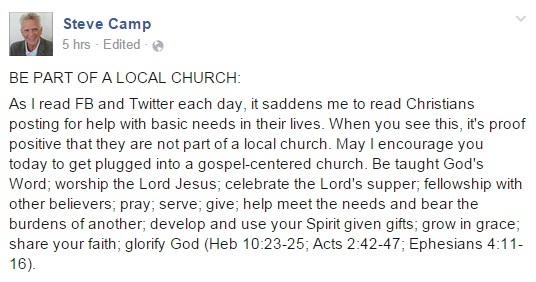 As I read FB and Twitter each day, it saddens me to read Christians posting for help with basic needs in their lives. When you see this, it’s proof positive that they are not part of a local church. Oh really? Home fellowships are in a much better position to help people because of expendable income not going to the Protestant temple tax. As a former Reformed elder, I can tell you what percentage of tithe goes to infrastructure and it ain’t pretty. Not only that, there are always strings attached to any help you get from a Protestant institutional church. One such church offered to pay for my education in fire safety engineering. I said no because I knew it was a control move. In fact, because of what was going on at the time, their motives were so obvious I was embarrassed for them. Home fellowships accomplish EVERYTHING we are called to do at a fraction of the cost. May I encourage you today to get plugged into a gospel-centered church. Being interpreted: a church that continually “shows forth” the same gospel that saved us. That’s Protestantism: a return to the same gospel to maintain forgiveness for “present sin.” Calvin taught that sin in the Christian life “removes us…from grace” (“grace,” ie., justification) and reforgiveness of such sin can only be found in formal Protestant church membership. Be taught God’s Word; worship the Lord Jesus; celebrate the Lord’s supper; fellowship with other believers; pray; serve; give; help meet the needs and bear the burdens of another; develop and use your Spirit given gifts; grow in grace; share your faith; glorify God. Sitting under the teaching of seminary certified philosopher kings, taking the Lord’s Table, being faithful to the church, tithing, etc., “imparts grace” (justification) and are the “means of grace” (justification). Also notice that instead of worshiping God in spirit and in truth wherever we are because our bodies are the temple of the Holy Spirit and not some “local church,” “worship” only takes place when we meet corporately in the local expression of the “holy mother Church” as Calvin enjoyed calling it.